“Like medieval clockwork” – copying the missing Queen Mary harp iron tuning pins. 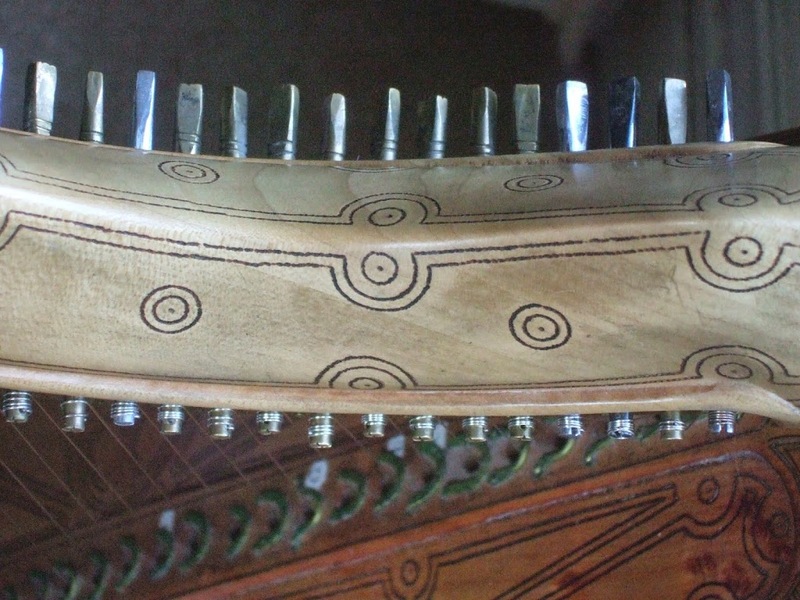 When I was commissioning my replica of the Queen Mary harp in 2006, I paid attention to the 30th tuning pin, which is obviously a later addition, shorter, made of iron, split end, different drive, and off the main row. This pin is now missing but I made a copy of it based on descriptions and old photos. I made the 29 brass pins with their scores on their shafts copying the museum photo of the 21 pins now in the harp, and for the 8 missing pins I made the same design of brass pins without scores. If I had been more on the ball back then I would have noticed that those same old photos and descriptions I used for the 30th pins, also show the missing 8 from the main row, and those missing 8 are plain iron not decorated brass, and 5 of them have split ends. 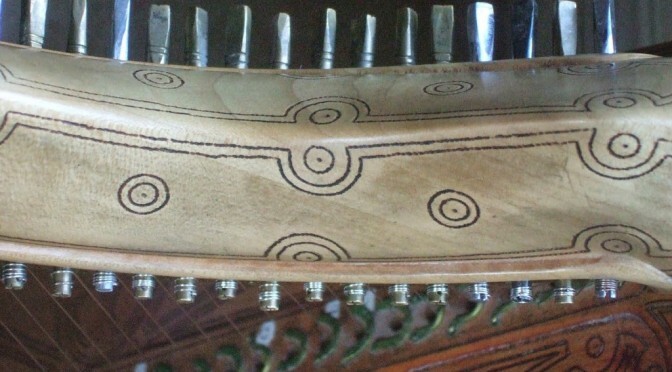 So today’s project was to make 8 handmade iron pins, and install them in the harp. The contrast of the iron and brass pins is subtle but interesting in appearance, reminding me of my initial reaction to the handmade decorated pins: “like medieval clockwork”. I broke the lowest gold B string taking it off but there was enough spare to rewind the toggle and reuse it. The string had thinned where it went over the pin – presumably a gradual process over seven years since I fitted it in 2007. The description is in R.B. Armstrong's book: he describes the different pins and mentions the iron pins with split ends. I confirmed the description by looking at old photos – there is a view of each side of the harp in Armstrong's book, and there are various old black-&-white and colour photos that the Museum supplied me with back in 2006. Thanks to Karen Loomis for lots of insightful comments into what is going on with the history of pins being removed and swapped around over time!